a) Not sending the receipt. b) Not sending a thank you. c) Not communicating before the change of venue for the donated items. While searching a stash of Civil Air Patrol complaints, I encountered this email exchange regarding one of the events of the CAP Historical Foundation theft previously reported in the Dayton Daily News and in Kathryn’s Report. The exchange is between Lt Col Jim Shaw & Maj Ed O’Brien and about the rare Gen John F. Curry archives that Maj O’Brien had donated to the Civil Air Patrol Historical Foundation. Jim Shaw was the CAPHF Executive Director and the CAP National Curator whereas O’Brien was involved in history outreach for Colorado Wing. Complaints filed against Shaw were found to be SUSTAINED by an investigation conducted by CAP Inspector Generals. To avoid announcement of another Civil Air Patrol scandal prior to the Total Force announcement, Maj Gen Chuck Carr deviated from CAP regulations to suppress the findings of the report and to harm the complainants and investigators. Lt Col Jim Shaw was soon removed as National Curator and he and his friend Lt Col Richard Greenwood sought to retaliate against those who exposed him. 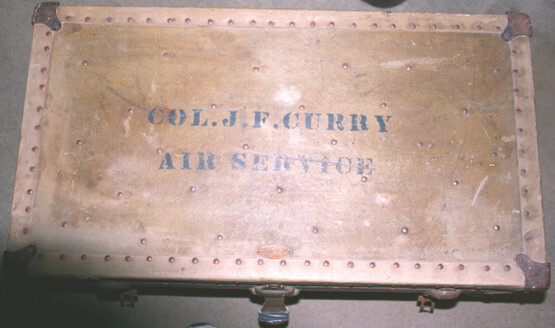 Please see the attached picture of the Curry trunk and the stars and wings. Please note the newspaper for today. Many things I am short of. Integrity is not one of them. 1. I think integrity is doing what you say and when you say you’ll do it. You’ve told me 4 or 5 times (or more) that you were sending the donation receipt to Sheila. You didn’t. It is too late now as the donation date and receipt date can no longer be reconciled unless she modifies her tax returns from the last 2 years. This is an expense which was unnecessary, except for your ongoing lack of response. 2. I think integrity is not lying about why the receipt wasn’t sent. The real reason is likely to be – you forgot. Even after numerous emails and a bunch of reminders on the phone from me- you forgot. I think we had 4 conversations (or more) and I found 3 or 4 followup emails regarding the same subject. You gave your word – yet you forgot. Or perhaps you were hoping no one would keep track of this and you could take this piece of history as your own in an act of theft by conversion. I can’t tell. It all looks the same from here. However, your answer was you’ve been “busy” is both dismissive and patronizing. 3. I think integrity is not unilaterally changing the disposition of the donation – the donation was for exhibit at Maxwell or Lowry at Wings Over the Rockies Air and Space Museum. You changed this without notice and that was disrespectful to the Curry Family and to me. I had the exhibit placed at Wings Over the Rockies – you knew this – but we both preferred that it go to Maxwell and we both agreed. The family agreed too. I can now no longer offer display at Wings as that space has gone to another exhibit – which is not a CAP exhibit. The size of the footlocker was known to you before the item was sent to you. We had a discussion and I gave you the measurements. So your statement that it was too big to be put in the display is unworthy as you had opportunity to check the fit before delivery. 4. I think integrity – means one thing for you and another for me. 5. I think you have damaged the respectful and sincerely cultivated relationship with the Curry Family because you’ve been too busy. Or, forgot. It doesn’t really matter. Which ever it is that doesn’t sound like integrity to me. 6. If I must belittle you, beg you, shame you, yell at you, or send you 8 reminders over 16 months – so that you will act with integrity – That is actually NOT integrity. Shame on you Jim and in this – I am being honest with you. Your protestation is noted. Unfortunately it doesn’t fly with me on many levels. Thanks for the feedback. The intention of my email was to show you that the trunk was still here not to provoke a personal attack. There are apparently more perfect people in CAP than I am aware of. I am not one of them. 1) I have spoken with Col Blascovich and I will return the trunk to you so you can designate where it goes. I will return the trunk and the stars and wings if you want all. The stars and the wings will fit in the display. I can send them to CAP HQ for the display. The only thing we knew about the display area at NHQ was the room size the displays were not final until shortly before the building opened. The trunk was offered as agreed but not enough room for it to be safe. Please send address and I will send it back to you. I would hate to send this to the wrong address. I will send it all registered mail with return receipt or signature required. That way I am not accused of stealing again. I will also save the receipt so I can show CAP and any others that I haven’t kept it for myself or sold it on Ebay. By the way my ebay ID is [redacted], you can check my stuff out if you like. It is very disappointing to think I am accused of stealing from you or anyone else, you are right in that I made a mistake but what does integrity say about personal attacks. The personal attack was not necessary. There’s a difference between feedback on job performance and accusations of theft. I wish you understood what I do go through to make sure that what I do, IS Transparent for CAP and CAPHF. You let me know what you want back and I will send it. Len has been CC so that he can act as my witness that I am not offering to sale, trade, or anything else. One accusation and personal attack is enough for me. Since it is obvious that you are offering assertions and not actually responding directly to any of the issues raised (16 months – 8 or more reminders – no tax receipt – not even a thank you letter to the Curry Family – and not placing Curry material in the agreed place) – I see no need to offer advice. But this isn’t about just bad manners. You were derelict and repeatedly so. You said you would do a thing. You said many times you would do this thing. You didn’t. Regarding your note below and reference to perfection. Perfection and integrity are two different things. These are two different words and have two different meanings. In the note below – your confusion on the topic is apparent. Fuzziness on these words is meant to confuse your responsibility. It is meant to have the insult you feel trump the lack of integrity you showed. It is designed to let you regain your loss of pride without doing anything but acting indignant. Are you confused by these words? Were you responsible? Is perfection being demanded? Or is it simply about keeping your word? When you do not keep your word for well over a year – and through many reminders – any explanation is possible for this lack of integrity. Theft is a feisible explanation. I would be derelict if I did not raise that possibility and see to it that the matter be addressed directly and promptly. Your personal assurances aren’t worth much. On this, I have multiple examples. Regarding your job, education, or life situation and its affect on this matter – It would be best to be honest about these things up front. You weren’t. It would help to be honest on the backside and you haven’t been. Please reduce all communications to writing for precision and clarity. I can neither trust your memory or your fuzziness with language. 1) I acknowledged the oversight in the conversation on the phone when I called. You called me and it seemed to be a cover-up. Because you were asking me to send you back up emails. You had plenty of emails. Your response was “You gotta understand Ed, I’ve been busy.” That is not an acknowledgement. This wasn’t an “oversight.” 16 months and 8 (minimum) reminders is not an oversight. I was busy was not a proper response. 2) My explanation is neither patronizing or skirting your words. Are you aware of my home, job, or personal situation. NO! Are you aware of the other CAP related stuff that has taken place in the last several years. NO! I acknowledged my actions or lack there of in the conversation. Your response was precisely both patronizing and dismissive. Being that you had 16 months to follow through – your response was you’ve been busy. I heard those words. You said those words. That IS dismissive. So are you stating that you didn’t mean those words? AND what you meant to say was – your home and job and personal situation is such that you can’t afford 30 minutes and a stamp to send the wonderful Curry family some significant response. Really? 30 minutes in the last 16 months? That is as dismissive as it gets. Hell, I would’ve written the thing and all you’d have to do is sign it and send it. However you kept stating that you’d get to it. 3) The donation was to CAP with the intent to go to Maxwell. It couldnt go to Maxwell. It was still a donation to CAP. I spoke with Col Blascovich so we could return it. How is that not trying to fix part of the situation? The situation is yours to fix. I can’t keep the promise under which the donation was made as Wings Over the Rockies placed another exhibit before you offered to return the footlocker. I don’t have a private collection. I don’t collect anything except CAP items that are to be sent to National or kept at Wing. However, because of this mess – that won’t happen again. AND once I am finished with the Curry diaries they go back to the family too. I am not putting myself in this situation again. Why? Because you are unreliable. I care deeply about both my word and your lack of follow through. In this case you didn’t just break your word many times. You broke my word too . You handle promises with casual disregard. I do not. I’ve told you several times that I do what I say. I don’t duck on responsibility. About all I am getting from you is an immature, self absorbed “the dog ate my homework.” I’ve been busy is just that kind of response. 4) Not sending a receipt is a mistake and oversight, when you accuse someone of stealing then it becomes integrity. Accusations without merit. Integrity has many components. Theft is one of several possibilities discussed. When you simply won’t do as you promise -over-and over-and over-and over-and over -and over-and over -and over again – there are any number of possible reasons. However, there are no good excuses. Does this surprise you? I will add a quote from my previous email about feeling offended.- for you it – is designed to let you regain your loss of pride without doing anything but acting indignant. Maybe you’ll get over that before we finish this discussion. YOU ARE NOT A VICTIM. YOU HAVE CAUSED ALL OF YOUR OWN PROBLEMS. Pretending to be a victim is a sure sign of guilt while deflecting responsibility. 5) It was not my intention to damage any relationships with anyone. I apologize for that and hope they will see it was not your doing. Your intentions are of no concern. Your actions are. I’ll finish this business with you before I disturb the good Curry’s again. 6) As to my note about perfection. I am sure that everyone in CAP has done everything right 100% of the time 100% exactly right. No one in CAP has ever forgot to do something. The angst this creates goes beyond the trunk. The trunk is here and has always been. The angst this creates is accusing me of stealing without asking me directly about it. This effects my family and my job and it also effects me within CAP. Then you should do what you say. This was not some trivial acquisition. This was the real deal. Yet you treat it as if it were – nothing. So far – the Curry family has no idea about how we treasure this gift. I have begged their indulgence. I am not going to do that anymore. So far Jim you’ve back peddled. You’ve not offered an honest apology. You’ve not come up with alternative plan other than to make me responsible. You’ve bobbed and weaved and double talked. What you haven’t done is stated – “I take full responsibility. I will fix this. It will never happen again.” I don’t have a suggestion for you. I won’t offer one. I only help those who get this major detail. I’ve talked about a CAP historian regular inspection procedure for months. You said that you and Engleman were working on it. Why isn’t that done? Leonard Blascovich stated he was working on a big Curry program. What happened to that? We’ve talked many times about intellectual honesty. You’ve not shown that. We’ve talked about keeping your word. I’ve stated that I always do what I say. I stand up when I am wrong. I don’t try to shift blame, confuse or deflect responsibility, act hurt, involve my family. Take responsibility. Take care not to give your word when you can’t keep it. Don’t shift blame. Don’t globalize accountability as in making your family afraid and then hanging that on me. Come up with a plan. Stick to the plan. Let the Curry family know about the plan. Ask them to agree with the plan. Beg for their forgiveness as you were planning something that took months to set up. And whatever you do – don’t fail to keep your word. I am not going to be much more help here as this is ALL on you. 1) I am not sure where you get a cover up mentality I never asked you to do anything other than an email about sending the trunk. I don’t save every email I get. It was an acknowledgment of sending the trunk, why in the world would I ask you to send an email if had had done something wrong. I asked you to send it for clarification that it went to the CAP not the CAPHF nothing more, nothing less. How is that a cover up? I have done this with other stuff that was donated, why would it be a cover-up. 2) Do you see where I put “I have acknowledged my actions or lack thereof”. Would it be better to put it differently. I never sent a receipt or a letter and should have. 3) Send me the address Ed and I will have it out by Tuesday. I have travel for the next month and I won’t be home much. Sheila Curry-Dekalbs address. I can’t find it on my computer or the internet. I will fix it. 4) Guilty of what? Not sending a receipt and a letter “true”. Your accusing me of theft that is different. There’s a big difference in a letter and theft. You accused me of theft. I accept full responsibility for not sending the letter. I however didn’t steal anything. 5) Duly noted, acknowledged, understood, and read. 6) This attacks my family because you’re accusing me of theft. Sending the letter is one thing accusing someone of theft is another. I can send the letter and acknowledgment to her, but you are still accusing me of theft. Accusations of theft is what I am talking about. I never asked you to take responsibility for anything. I asked for a clarification to whom’ the trunk was sent. That’s it. I never asked you to do anything other than an email. I asked for an email. You accused me of theft Ed, how else am I supposed to respond. “thanks”? 1)I did not send a letter, I should have. My mistake. 2)I will fix this, me not you I am not asking for anything other than an address. 3)It will never happen again. Feedback received, lesson learned. Now I would like the address so I may fix this. I have searched the internet and can’t find her address. Would you be so kind as to send me the address so I can fix this? Thanks for the input and information Ed. The address is all I need. If I could find it I wouldn’t ask. Please send address. I will send you a copy of whatever I send her. If this is ok with you. noted and I will ask at a later date. 16 months you have waited with this question? You have been unable to do your duty without this information for 16 months? Why didn’t you ask for it months and months ago? Why did you ask for it on that specific day? Are you claiming that you usually wait more than a year to follow up? Are you saying that this is your normal procedure? Why on that specific day – without prompting – did you called me out of the blue? You only call me – when you want something. We never talk unless you want something quite specific from me. Your unprompted call has a reason and you have not stated it. What is that reason? Yes it would be much better if you put it differently… you shouldn’t bury that lead. You should lead with that lead. That should be your headline. That should be your banner. That should be your rally flag so we can see in an honest way – you are sincere and contrite in response. Instead you have been reacting first to your own defense and quite immaturely – you should make the acknowledgment of dereliction in the clearest possible terms. Fair minded people will make their judgement upon your personal sense of responsibility. I haven’t had that sense about you in these discussions. I have literally been dragging it out of you. FOR INSTANCE – You’ve never stated any concern of how Mrs. Curry-DeKalb must feel. How bad, good, angry, distressed she must feel. What must the Curry family think of this? How you can make it up them. You’ve never inquired how bad I (Ed O’Brien) must feel for giving my word in your name and being repeatedly disappointed. Instead – It has been about you. It has remained about you. It has been about you exclusively. And, apparently relentlessly – about you. It has been about your family. It has been about your pride being hurt. It has been about your family worrying. It has never been about anything but YOU! That is not a good look on anyone. Every criminal in every prison reacts exactly the same way. As if they (the criminal) were the first victim. You will not find appeasement from me on this point. Not one bit. I’ve hired thousands of people in my life. I’ve fired a few of them too. Oddly enough – It is always for the same reason. Their repeated lack of personal responsibility to my company, coworkers, property, or cause. I will point this out to you because on this you now have no defense… you’ve spoken too much. It is now clear. So this piece of the issue is between you and me is settled. There was a bond we shared. I was your friend. I was willing to aid you for CAP history. No more. You’ve had time to reveal yourself. Finally we have the candid and unadorned – you. I will take care of it. This is something that must be done face to face. This must be a personally delivered act of contrition. I will do this probably next month. My address is [redacted]. Do not send the trunk. Send these documents only. Make sure you do this promptly. Read up on “theft by conversion.” This is a very specific thing. Look it up. There is actually no difference in this case. Read much on the topic. It is illegal in Georgia. The fines and penalties are stiff. Being an archivist for a 501(3c) this is a topic upon which you must become conversant. Once again your family has nothing to do with this. Your dog, your neighbors, people you meet on the street have nothing to do with this. If you globalize your indignation – you do so as a selfish act of your own making. That is on you. That is a matter of your responsibility. Don’t hide behind your family to dodge responsibility. And don’t try to shift your feeling of victim hood to them. It is your indignation that is your problem in this matter. That is a specific allegation that needs to be investigated. That is misappropriation of a donation to a 501(3c) for personal purposes. Since you unilaterally changed the donation’s venue and commission. Since you didn’t track, communicate, or relate this change in writing. Since you kept the items in your house. Since you didn’t demand or implement inspection procedures. Since you didn’t redress any of these issues over the last 12- 16 months and – Following this specific trail of non-coincidental, repeated, and recurring problems I was lead to ask – quite specific questions about you. About these questions? Some you have answered. Some you have avoided. Some will be asked by others. I am not a lawyer. I am not an IG. I am a historian. I would have been quite derelict in my duties if I didn’t follow up on the items above. You need not answer me. I have all the answers I need. Now a personal note. You have misused my personal assurances and therefore my word and good name. Your remorse, contrition, or sorrow is covered over by your slathering of indignity. You put me in a bad place. You misused my trust in you. You misused my good name and good intentions. There was no good reason to do this… except you were busy or you forgot… or perhaps some other vague and convenient excuse. I got it.